Whilst reading a book by Tobias Mews called ’50 Races to Run Before You Die’ there was one photo that stuck in my mind. It was the picture of a narrow ridge above the clouds, which looked like something out of ‘Jurassic Park’ or ‘The Land That Time Forgot’. After experiencing some truly memorable scenery in Cappadocia I was keen to take part in another race that would feel like an adventure. I figured that if I was going to run / walk for over 24 hours, the surroundings had better be pretty spectacular to take my mind off the monotony and pain. With the UTMB coming up later this year, I was also looking for a race that would provide a challenging testing ground. The Madeira Island Ultra Trail (MIUT) seemed to tick all the boxes; scenic, long (115k+), undulating (7,200m+ ascent) and technical! This race fills up reasonably quickly and is certainly growing in popularity. 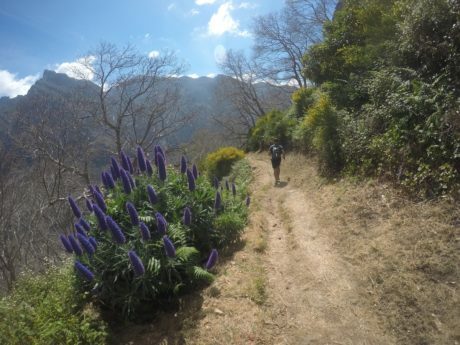 It’s part of the Ultra-Trail World Tour and therefore attracts runners from all over. I was lucky enough to secure a place shortly after entry opened and I believe it filled up in a matter of weeks. The main event had a field of over 850 runners, but there are also shorter races for those not interested in completely beasting themselves! 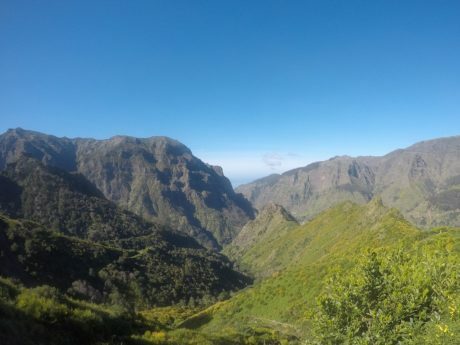 Still, the 80k, marathon and 16k races are probably still tough given the topography of Madeira, which is the top of a massive shield volcano that rises about 6 km from the floor of the Atlantic Ocean. Travelling to Madeira from the UK seemed relatively straightforward with a number of direct flights each day. I ended up flying from Gatwick and the flight was approximately 3.5 hours long, so plenty of time for shuteye before the race. 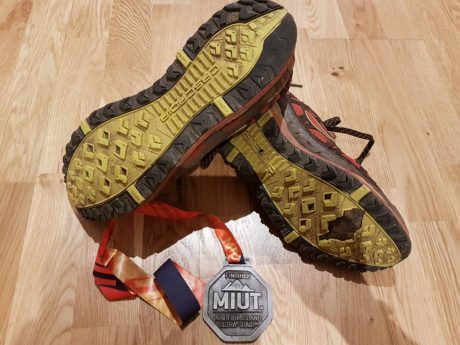 On arriving at the Cristiano Ronaldo Madeira International Airport, named after their local sporting hero, I was asked by the lady in the passport booth whether I was there to take part in the MIUT. I guess ultra runners are pretty easy to spot among their normal holiday-goer demographic! I had decided to stay in Machico which is where the race finishes and also where registration takes place. This was a very short taxi ride from the airport and I dumped my bags at the hotel and registered for the race in absolutely no time at all. I had also bumped into a couple of friendly Norwegian chaps who were also racing, so I spent a bit of time hanging out with them before the press conference, pre-race briefing and pasta party. The press conference itself was pretty interesting and I recognised a number of well know runners taking part. The race was going to have a very strong field with the 2016 Ultra Trail World Tour Champion and a number of other sponsored athletes taking part. I looked around in the hope of seeing runners who perhaps didn’t look so fit, but everyone at the briefing looked like a racing snake, which was slightly intimidating to say the least. If I was lucky enough to complete the race, I had a fair chance of being at the back of the pack! The race itself starts at midnight on Friday on the Western side of the island. Friday daytime was a little surreal as it involved doing as little as possible, eating plenty and attempting to sleep. I say ‘attempting’ as it’s pretty damn difficult to sleep during the day when melatonin levels are low and you know that you have a big race coming up. In any case, I packed all the mandatory equipment, ensured that my drop bag was ready, and lay on my bed with a Buff over my eyes trying my very best to get some rest. 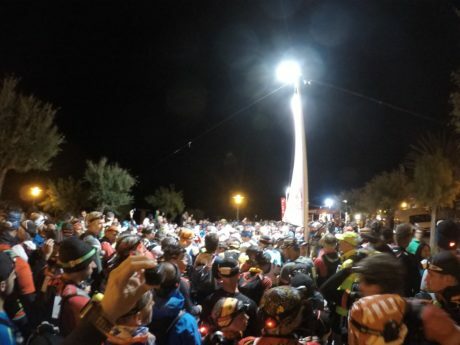 Transfers from Machico to the start were well organised with a set of buses departing around 9:30pm and arriving at the start line around an hour later, which provided plenty of time for any last minute equipment adjustments and visits to the porterloos. The race started bang on midnight and I slowly shuffled forwards amongst the masses of high powered headtorches and flashing red LED lights. It was a bit like being at a rave without the music once we left the starting area! The road was wide enough that it didn’t feel too congested and it was steep enough that we were forced to a walk within minutes. The crowds were great in the early stages providing encouragement as we headed out of the urban areas up into the hills and mountains. The first couple of aid stations were reasonably chaotic affairs given the amount of runners arriving simultaneously. It was probably because I was mid pack, so I was forced to sharpen my elbows in order to gain access to the water and food on offer. I decided that I wasn’t going to touch any caffeinated drinks until half way through the race, so I stuck to water mixed with a little dash of Tailwind for good measure. The aid stations had plenty of delights on offer and I found myself drawn to the crisps, chocolate, cake, banana, soup and cheese. Fortunately these all mix quite well and sat comfortably in my stomach. The terrain throughout the race was very challenging, with plenty of steep ascents and descents. There were also stairs…did I mention there were stairs? There were literally thousands of the things! I wonder if anyone actually knows how many there are along the course. I’d guess tens of thousands. The terrain was also pretty slippery in places despite the fact that it wasn’t raining. I fell on my backside a couple of times and picked up a few minor cuts and bruises, but nothing to worry about. It’s difficult to stay entirely focussed for long periods of time without sleep and my shoes were not providing as much traction as I needed. Anyway, around 20 miles into the race we started merging with the runners doing the 80k ultra and this is where things started to go wrong. On a short section of road I noticed something bright on the floor out of the corner of my eye. It just happened to be a huge chunk of the sole of my shoe that had fallen off. I was wearing Brooks Cascadia which are super comfy but perhaps a little on the heavy side. Anyway, I should have chosen some newer shoes as my trusted Cascadia, which were a couple of years old, had decided to start falling apart on this race! Needless to say I was a little concerned but there was nothing I could do apart from push on. The next aid station was absolute chaos with the 80k ultra runners all hitting at the same time and it took ages to get any water as the fresher runners were definitely more assertive. Getting enough fluid was going to be essential though given that the next section was around 15k with plenty of climbing in blazing sunshine. I remember the start of the climb shortly after the aid station as it went up alongside a large green pipe. This pipe seemed to go on forever and the path often cut underneath forcing you to duck under. This made me get into some slightly awkward positions and this is when I twisted my knee! It didn’t feel too bad at first, but I noticed it the second I started to descend any steps. My knee started locking up and it became very painful to bend. This was incredibly frustrating and it was at this point that I thought the race was over! I had no choice but to push on to the half way aid station where I knew there would be doctors. The long and steep descent towards the aid station was incredibly slow and painful, but other runners passing provided plenty of encouragement and the scenery took my mind off things! As I hobbled into the aid station and found the medical area, half of me wanted to push on and the other half wanted to give up. I found my Norwegian friend sat on one of the beds and it sadly seemed that his race was over. He had really bad blisters under his toenails and also had knee issues as well. One of the doctors attended to me and I explained my problem. I then asked whether the knee could be tightly bandaged in order that I could try to continue. Having come this far I really wanted to see whether I could go any further, even if it meant going slowly. I was an hour and a half ahead of the cutoff so I figured it was still possible to carry on. After all, I’d made it over half way and the best scenery was still ahead! The ascent after the half way point was brutal and relentless. The sun was still blazing and the path seemed to continue upwards forever. 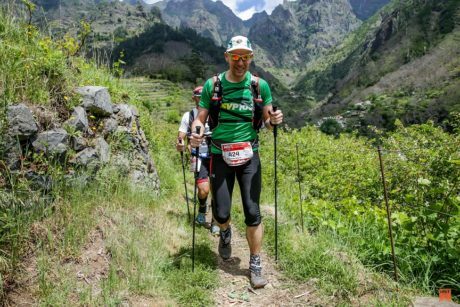 I was filled with a new sense of optimism though as the ascent provided some relief for my knee and I started overtaking a number of competitors, and soon was amongst trees and taking advantage of the shaded path. I was also getting quite excited about ascending towards Pico Ruivo and Pico do Areeiro where the amazing pathways above the clouds were to be found. I ascended ~1,000m without stopping and soaked up the amazing vistas at the top of the climb. As I approached the top of the path I recall a runner standing above me in the clouds shouting out that he was ‘king of the world’! I admit that I felt pretty amazing myself but decided to be a typical reserved Brit and kept my mouth shut! The pathways were truly stunning at the highest points of the race! The route was often narrow with steep drops on the sides and was definitely not for those who are suffer from altophobia. There were plenty of steep stairs, long dark tunnels, and treacherous looking pathways, with clouds sweeping across the landscape. The experience was highly memorable and it’s definitely a place I’d like to revisit at some point. Fortunately my knee started feeling stronger and stronger, and whilst I was conscious that it wasn’t 100%, I was able to move more quickly. As I descended from Pico do Areeiro darkness began to envelope the trail. The pathway down to the next aid station was slippery and earthy, so I took it quite steady so as not to damage my knee any further. I didn’t feel too great when I arrived at the aid station in Ribeiro Frio, but I was filled with optimism knowing that there was only one large 600m ascent ahead of me. This optimism rapidly drained as I arrived at the start of the ascent. It was up an incredibly steep and slippery slope which was really challenging and punishing. Anyway, I gritted my teeth and pushed on knowing that the summit would eventually arrive. At the aid station located at the top of this ascent I also bumped into a couple of chaps that I’d been running with earlier in the day. It was great to see some friendly faces and we left feeling optimistic as it was all downhill to the finish! This optimism was short-lived though as the descent seemed to go on forever, and it was quite steep and technical in a number of places. It really punished those tired legs and there was still around 25k to go until we were going to be back in Machico! One thing I learned is that it’s important to pay attention to the aid stations and where you are in a race! I lost count of how many there were to go and I thought that I was much closer to the end than I really was. As such, I barely spent a minute in the penultimate aid station thinking I was at the final aid station. I wondered why everyone else was sitting around looking dishevelled and why no one else was running. I was now running along a high clifftop path with the sounds of the ocean breaking somewhere below. I was overtaking runner after runner and it felt like my legs were pretty fresh. After a short period of time my headtorch began to blink, indicating that the battery was running low. I was conscious of the narrow path and the large drop at the side so figured it was best to take some time to attach a new battery as I didn’t want to be fumbling my way in the pitch black. With equipment fully functioning again I made rapid progress of the descent and carried on overtaking people. That’s when I suddenly arrived at the next aid station! Damn…there was still another 5k to go!!! Still, I could now see the lights of Machico and I figured that it would only be a matter of time before I saw the finish line. The final 5k were pretty fast, running along relatively flat paths alongside water channels. I hit the outskirts of town and it was nice to be running on tarmac again as my legs felt incredibly fresh. I almost sprinted down the final set of steps and along the finish chute and leapt over the finish line, feeling that I had energy left in the tank. I then sat down briefly to eat some food provided by the race and then proceeded to walk 1k back to my hotel which was back up another hill. By that point I didn’t care as I knew a shower and bed were at the end! The shoes fell apart but I made it! Completing this race really boosted my confidence ahead of the UTMB. 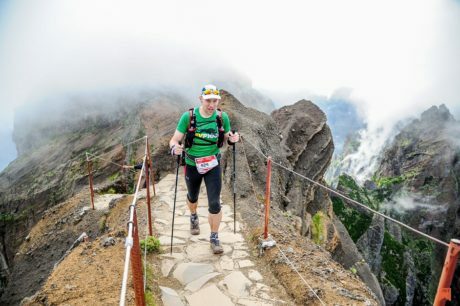 I’d highly recommend the set of races in Madeira, as they are extremely well organised and the scenery is truly magical and reminded me of my time in Peru trekking the Inca Trail. The memories of running above the clouds will stay with me forever and I’d love to visit this beautiful island again one day.